Tune up your suspension without breaking the bank! 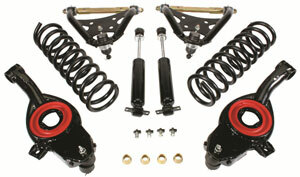 Kits include economy upper and lower control arm set, stock height front coil springs and gas charged front shocks. &COPY; Classic Performance Products. This "website" and all contents are property of Classic Performance Products. Prices subject to change without notice. Not responsible for errors or omissions. Please note that kits & prices may vary between certain applications.